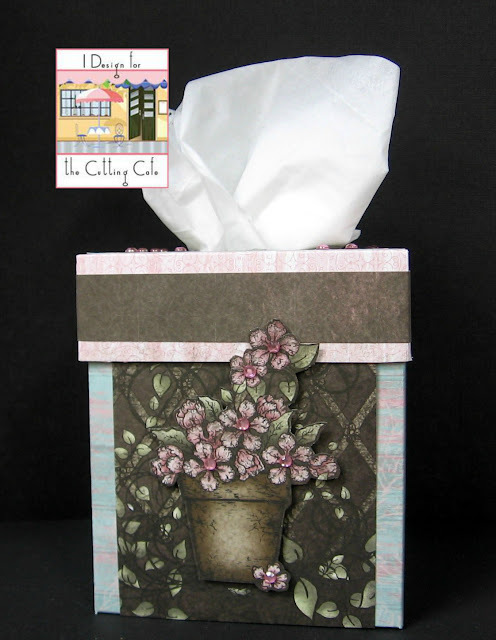 Today, I'm sharing a cute project that was made with one of the fun files at The Cutting Cafe. This bag can be filled with all sorts of things, and leans a bit to the manly side, which is something I always seem to need, and have trouble creating! I'm using the Tissue Box Cover. Once again, I have used the PDF version. All pieces were easily cut out by hand. No cutting machine? No worries! Just grab your scissors, print your pieces and have fun cutting! I do have a Silhouette machine, but for some reason, it's not cutting correctly, so until I get things figured out, I'll be using my little scissors! The Cutting Cafe has a LOT of fun files and inspiration, and the holidays are just around the corner! Regina has projects for every holiday, sports, etc., that are sure to bring smiles to recipients! Here's a view of the lid, embellished with designer paper. And here is a view of the inside of the box. I chose to have a bottom in mine for stability, but you can also use just the 'wrap' without a bottom. This is just FABULOUS! I love it!!!!!!!!!! Awesome way to decorate a tissue box. This is gorgeous! How very beautiful. Lovely tissue box with a pretty design. Pretty! I have made one with snowflakes that I use at Christmas time.